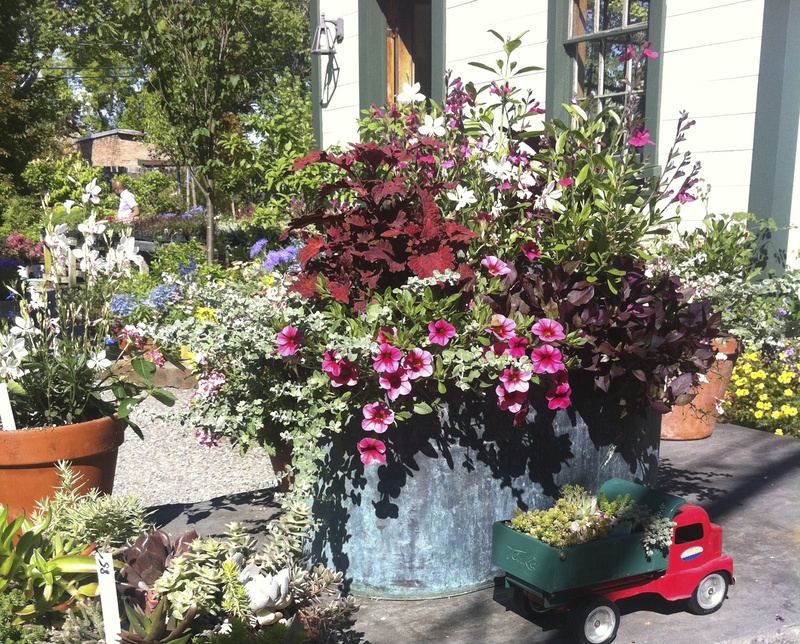 Is it too early to be talking about container planting? Is it ever? 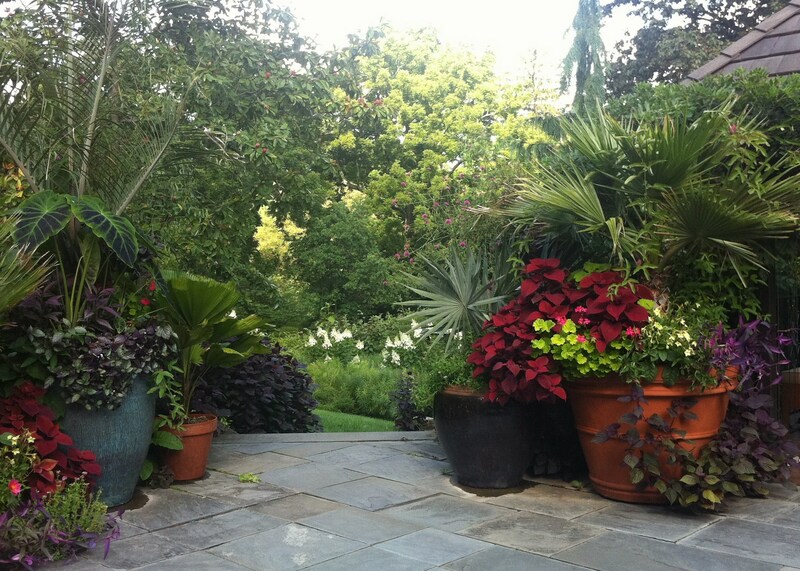 These glorious containers are just about the first thing you see when you venture into the wonderland that is Chanticleer Garden near Philadelphia. 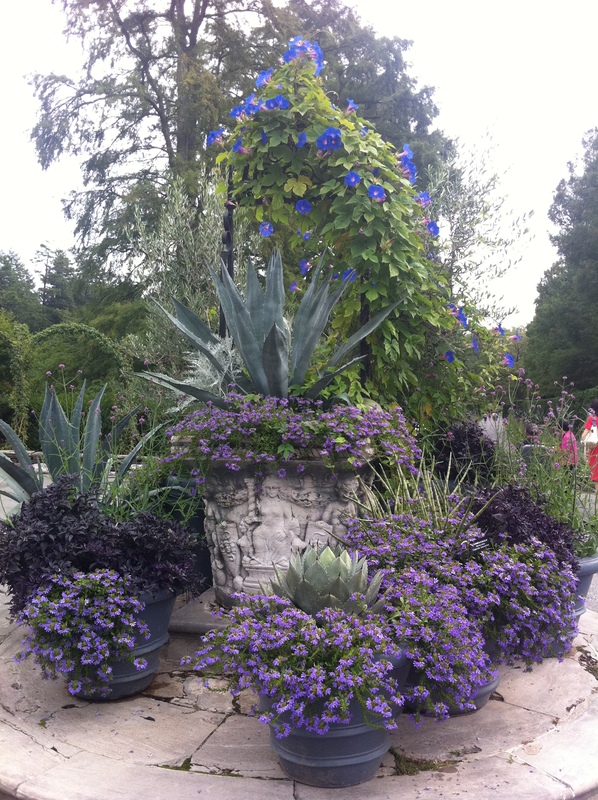 The tricks here include: large containers with drainage holes, clustering or grouping those containers, choosing similar or complementary colours and shapes with your containers, and using bold plants. Not simply annuals, but tropicals for scale and oomph, as well as interesting shapes, colours and textures. If you have a spot where your planters will get morning sun and afternoon shade (or filtered light), your options are practically endless. What is striking about this planting is the juxtaposition of context (i.e. 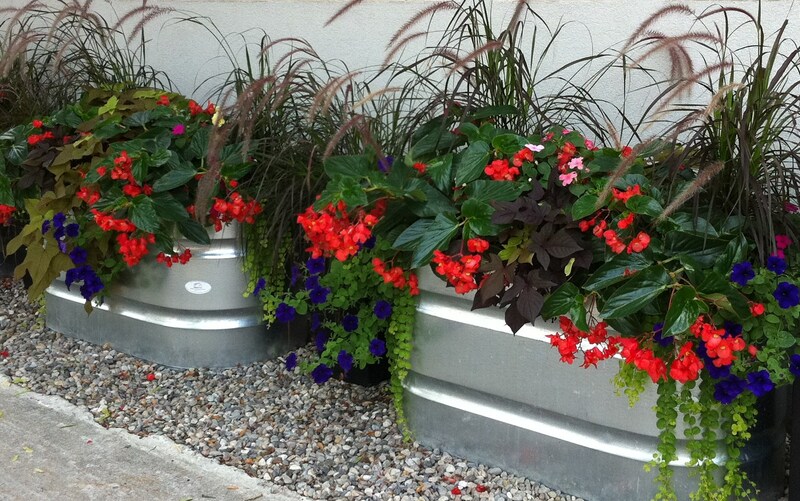 modern galvanized trough planters, pea stone and monochrome background) and raucous display — a riot of bright colour (angel wing begonia), loose grasses (purple fountain grass) and dripping chartreuse edgers (golden creeping jenny). 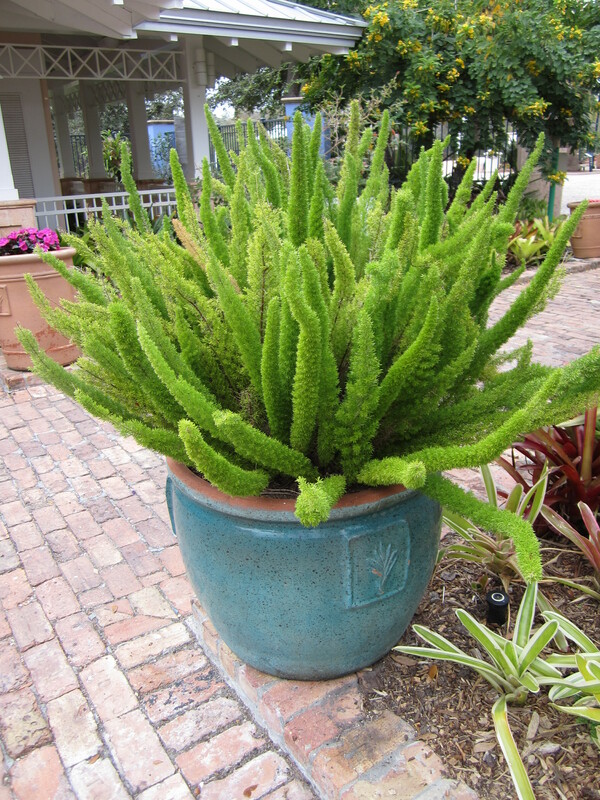 In contrast, here is a simple but no less striking container planting using foxtail fern (Asparagus densiflorus ‘Meyersii’) in a classic glazed pot. What I love is the movement in this fern, which aptly looks like sea anemones swaying in the ocean. I found it in the courtyard of the Florida Botanical Gardens in Largo. 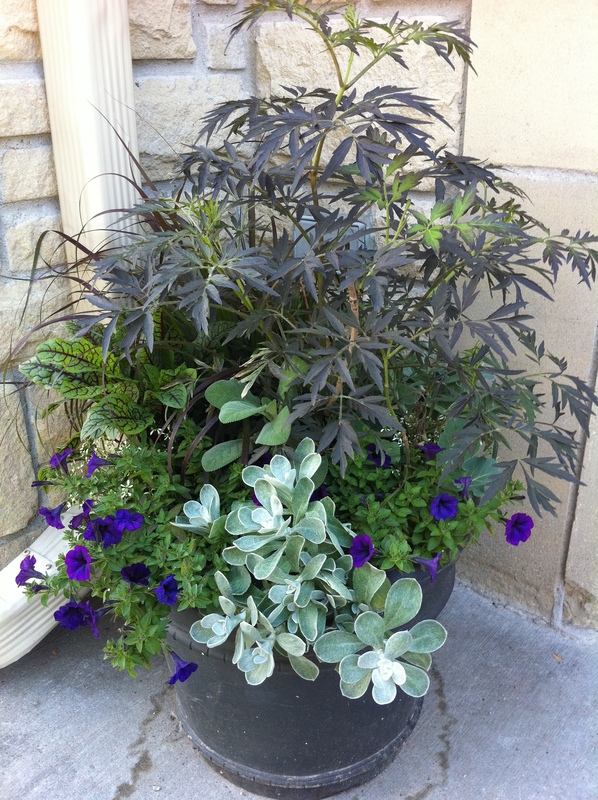 …and here is a similar tropical container planting on steroids! At Longwood Gardens, everything is big. 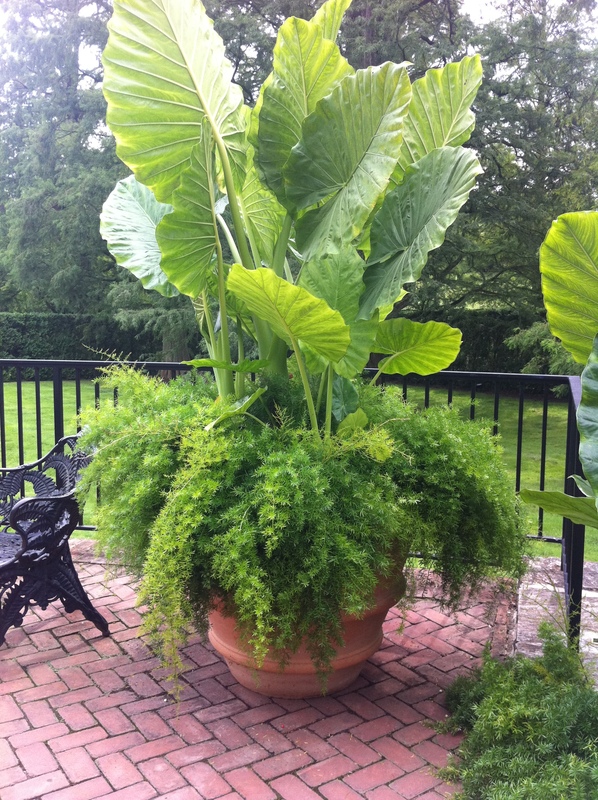 Asparagus fern plants billow out from a classic terracotta pot while the striking leaves of elephant ears (or giant alocasia/taro known botanically as Macrorrhiza maki) erupt from the centre. 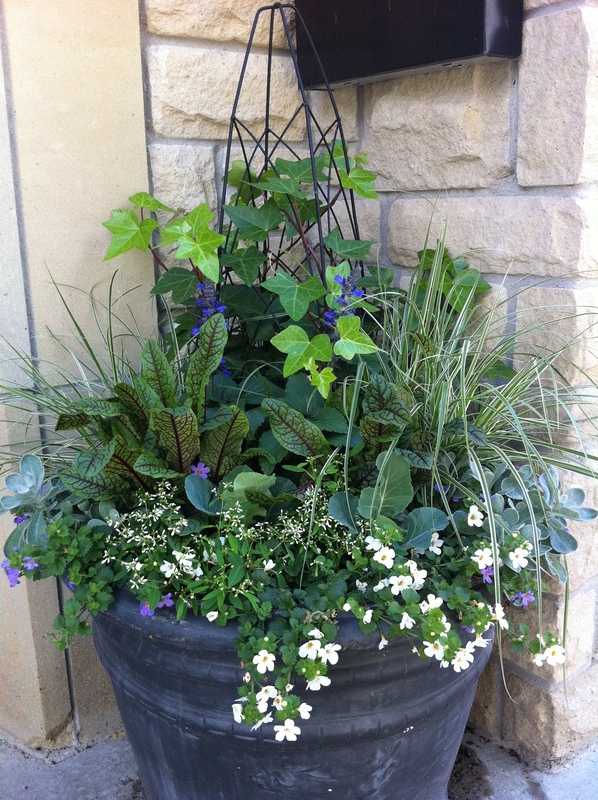 This kind of knock your socks off container planting needs lots of water and nutrients to keep it looking lush and green. More BIG displays at Longwood, which is not surprising since it reflects the wealth and ceremony of the DuPont name. 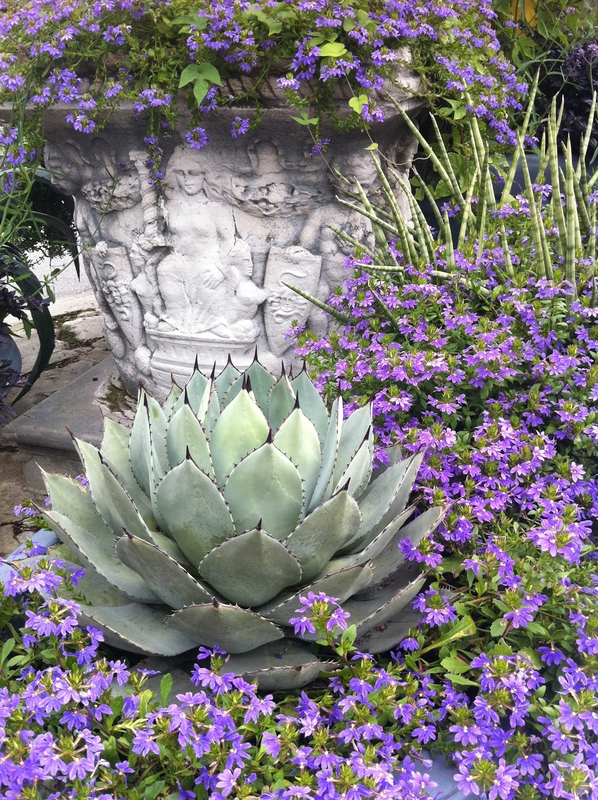 This purple and silvery-blue display uses an antique urn to showcase the deadly century plant (Agave americana) underplanted with everblooming fan flower (Scaevola aemula). This squat agave, with no less deadly spines, is called Palmer’s century plant (Agave palmeri) and is actually the largest agave found growing in the United States. 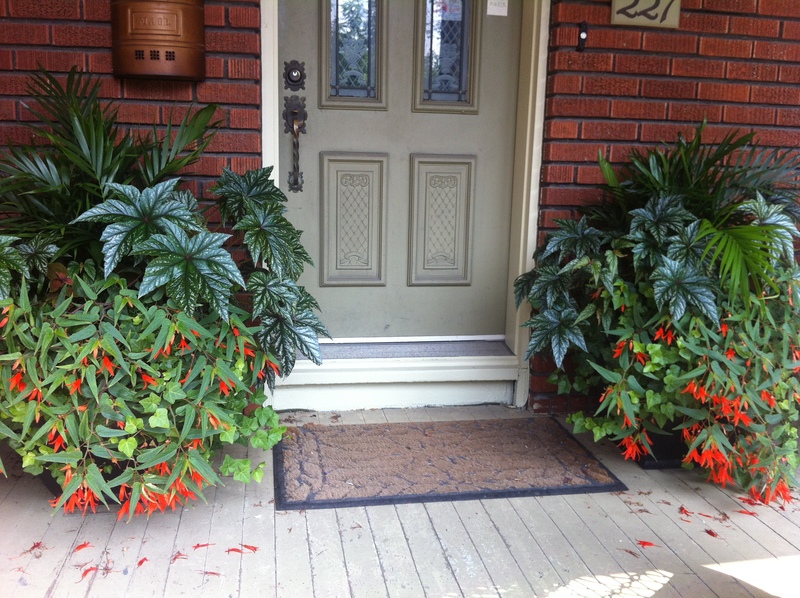 Big, bold displays using tropicals and annuals are what’s needed at a home’s entrance. Although this home is facing south, the front door is located on a covered porch so the planters flanking it must be shade tolerant. I used palms for height, decorative leafy begonias for oomph, angel wing begonia for bright colour and some simple english ivy for more trailing effect. The display is so lush you don’t need an attractive container when all is said and done! 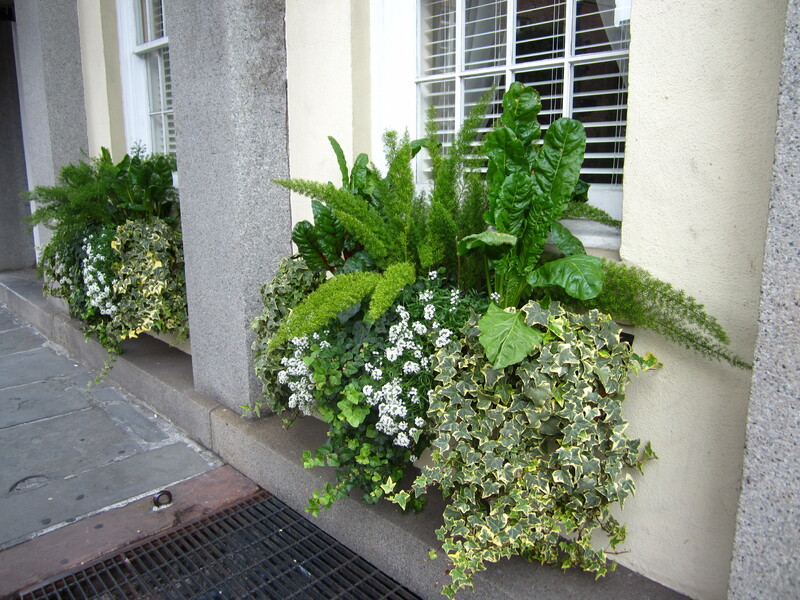 Another entrance also called for a pair of planters, but this time with a similar colour palette and different combinations of plants. Planters that grace public areas on frequented sidewalks have to present a unique face to the world. They have to be lush from the get-go, with plants that intermingle with each other and knit together so yanking any one out is next to impossible. Take that, vandals! 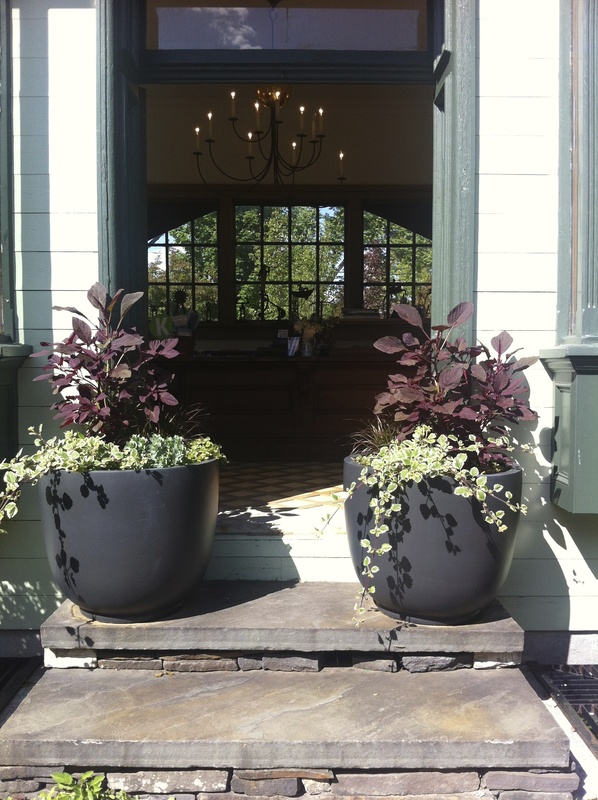 So take a lesson from these planters for this coming spring: plant lush, plant full and plant with a sensitive eye to colour and texture. You can’t lose! More relationships break up in January than any other month I read. Also more people sign up for gym and dating site memberships. January is tough enough. Let’s try to make it a tiny bit easier. 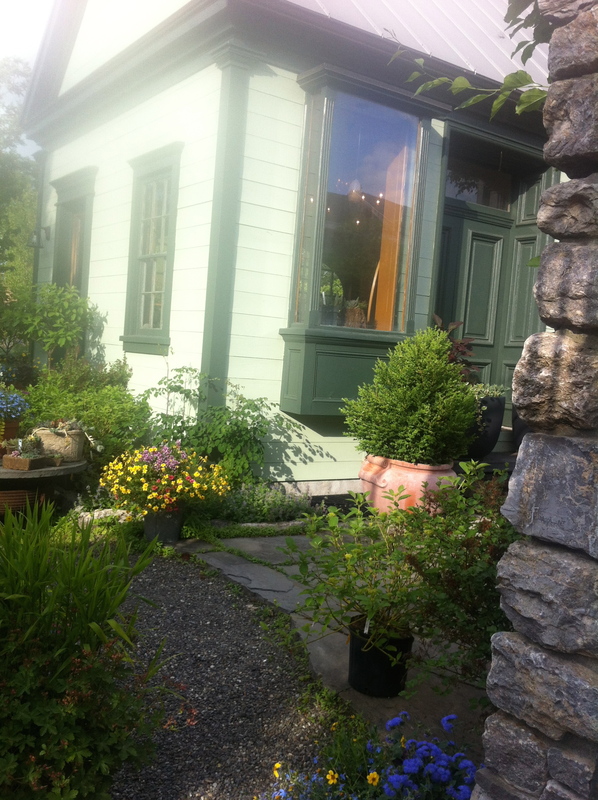 On my garden tour trip last summer, we visited a charming plant nursery in Hudson, New York, called The Secret Gardener. 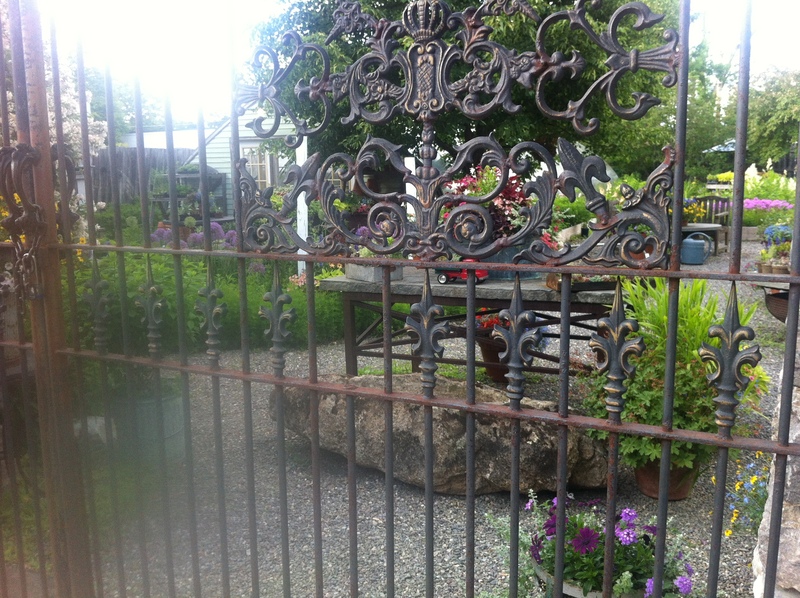 Behind a vintage wrought iron gate, this nursery is clearly a work of love and attention. 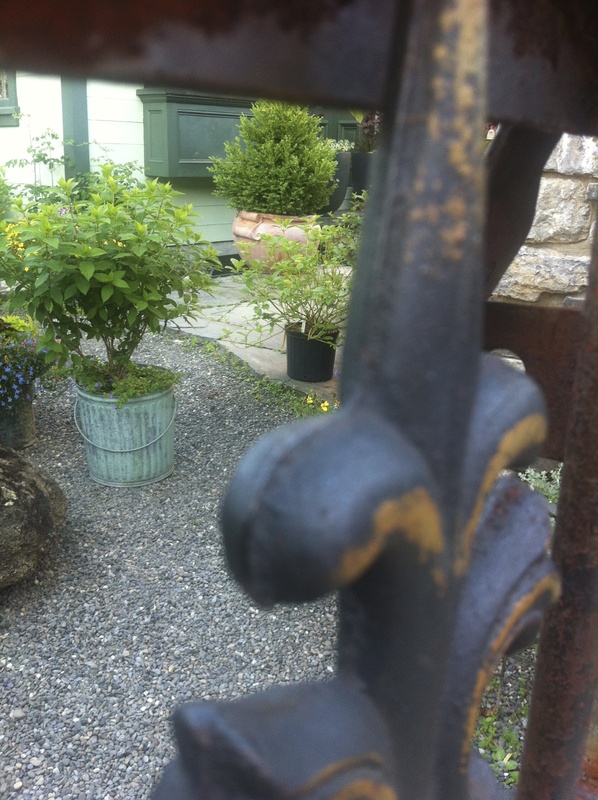 Our first view was after closing and we peered in and saw the beautiful pots, colourful vignettes and wood framed building that housed the cash counter and a selection of choice tools and accessories. We made a point of returning the next day before it closed and were delighted to walk around the beautifully curated sales and growing areas, carefully avoiding being drenched by the plumes of water. 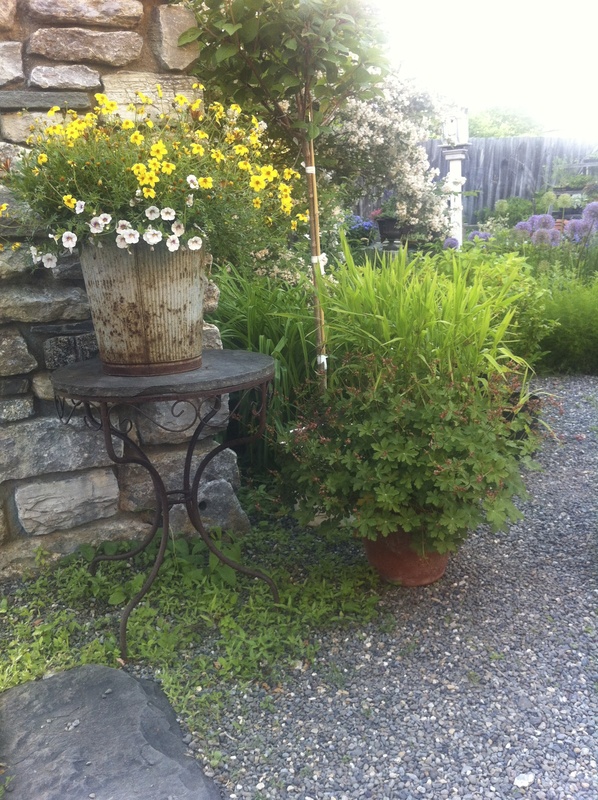 A boulder dressed in lichen and moss, an rusted iron table with a bright red dump truck planter and everywhere you look, artfully orchestrated plantings. 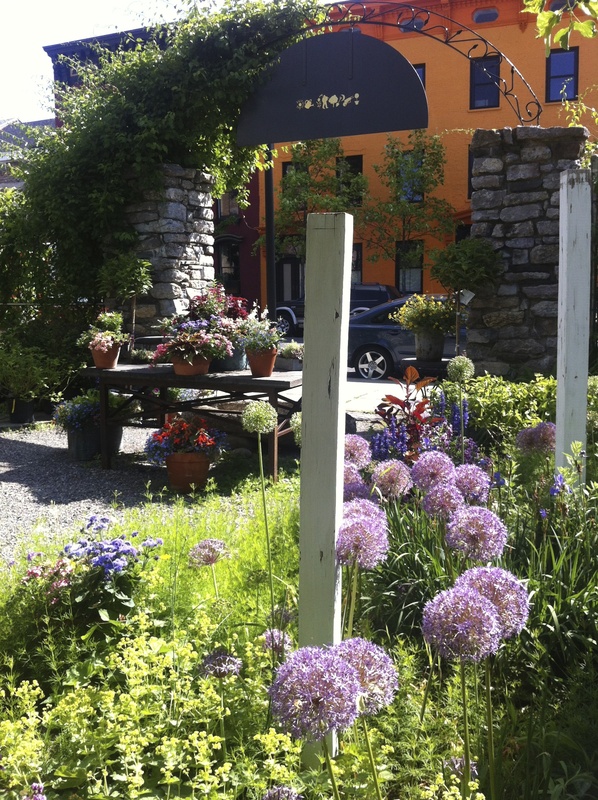 Not simply arrangements in planters, but striking islands of colour and joyful perennials bursting from the ground. Even opportunities for moments of repose. 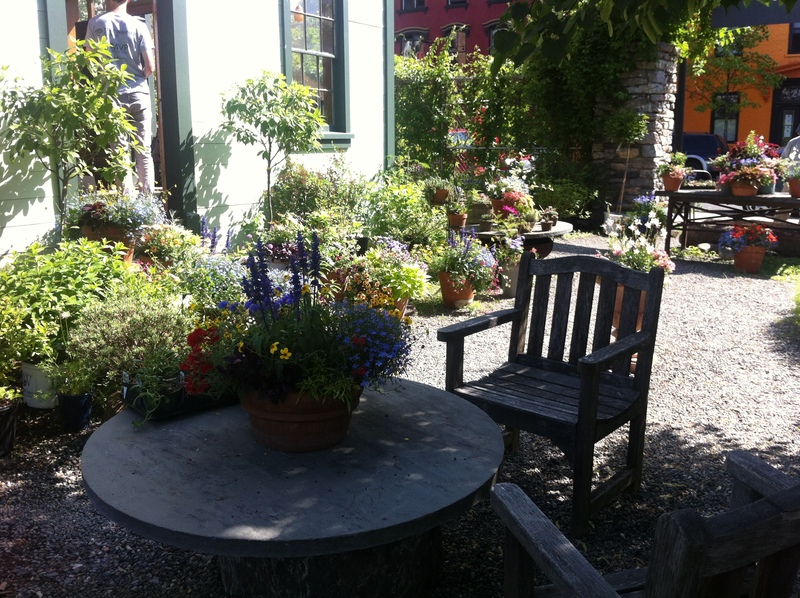 This could be your garden! 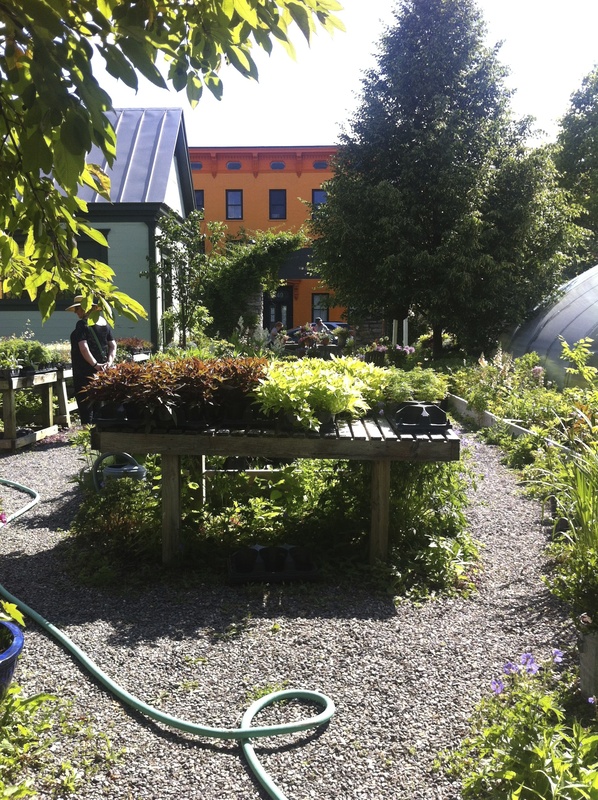 But here in this nursery, there is always work to be done …propagating… ….watering…. 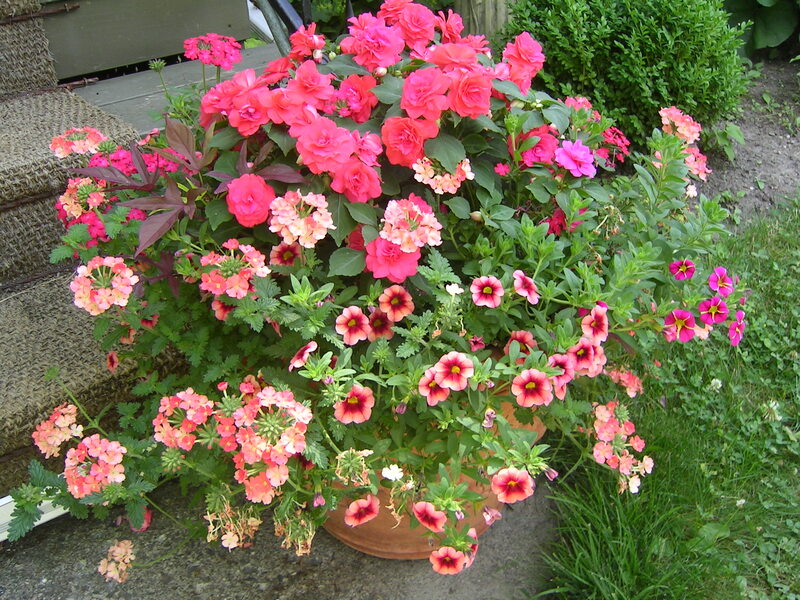 ….deadheading and primping…. 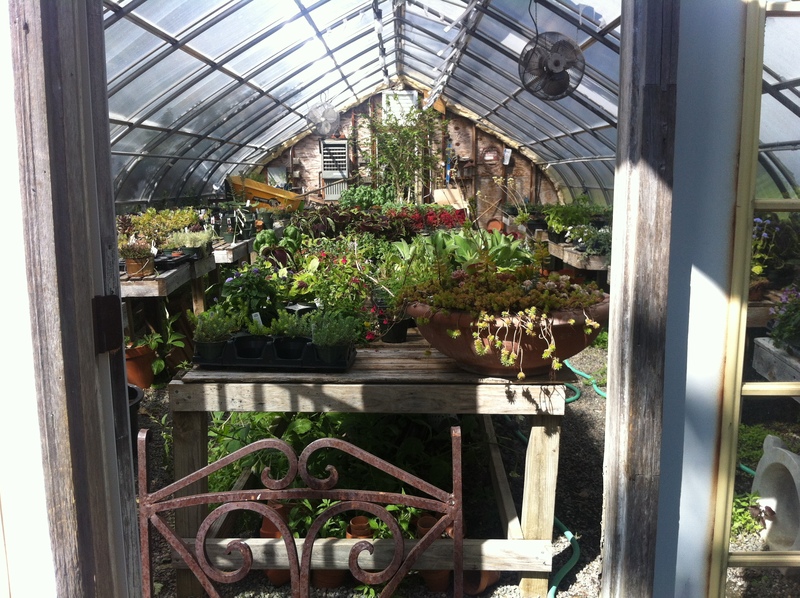 If you’re in this neck of the woods, it would be unfortunate if you didn’t visit this unique nursery. Because there aren’t many like it. And you will be deeply and deliciously inspired.